Summary: When Odilia and her four sisters find a dead body in the swimming hole, they embark on a hero’s journey to return the dead man to his family in Mexico. But returning home to Texas turns into an odyssey that would rival Homer’s original tale. 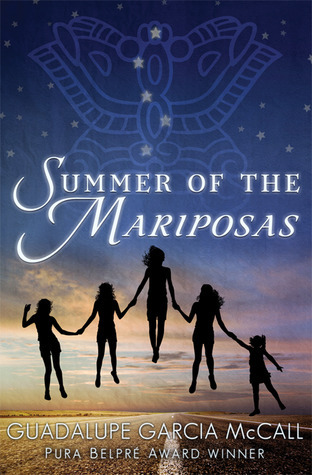 Review: There are a lot of things I liked about Summer of the Mariposas, and chief among them was the magical realism. The world that Odilia and her sisters find themselves in is a fascinating blend of modern life, Odyssey checkpoints, and Mexican folklore. I wish there were more YA fantasy books focusing on Central and South American cultures. (If there are any good ones, please let me know. I want to read them!) The lechuzas were delightfully terrifying, and McCall did an excellent job of redeeming the character of La Llorona. Her story was one of the two points in the book where I teared up. For as much as I loved the magical realism, the true heart of this story is the familial bonds between Odilia with her sisters and the sisters with their mother (and even grandmother). And despite saying that, I wish that either the book had been longer so that I could get to know the sisters better or that there had been fewer sisters to devote time to. As it stands, I don’t feel as if I got to know anyone besides Odilia very well. There was a lovely moment between Juanita and Odilia where Odilia got to subtly remind her younger sister that she doesn’t always know what’s right and that sometimes older sisters have useful things to contribute (buying sodas at the gas station, for those who have read the book), and that was a conflict I wish McCall had spent more time on. While I’m generally fond of the fire-forged-friends trope, I wish there had been slightly less physical peril with the girls and more emotional peril to draw them together. That said, Part III: The Return, was everything I wanted it to be. If you’re familiar with the Odyssey, then you know about the ousting of the suitors. The ousting in this book involved a great deal less blood, but it was still a crowning moment of awesome. I loved how Odilia was able to reconnect with her mother and that the journey she and her sisters went on really did make their happily ever after possible—and believable. Recommendation: Get it soon, especially if you’re interested in Mexican folklore, have a fondness for road trip stories or the Odyssey, or want to read books that focus on sisters or mother-daughter relationships. I’m going to have to check out McCall’s Under the Mesquite sometime soon to see if it is just as good. I had to warm up to the book, but soon fell in love with the wonderfully crafted tale. The magical realism and the extra stories along the way really made the book. I think this is one that I will re-read in the future. Yeah, same here. I also really liked the card descriptions in the chapter headings. I’m a sucker for little details like that. I felt the same way as Crystal. Getting into the book took awhile. But this is one I’ve been recommending to people. I spent a long time reminding myself that of course the girls weren’t going to call the police once they found the dead body even though I really wanted them to. Clearly I’m too sensible to ever be a main character. Once I got over that, things went much better for me.